Selecting and training people for your Lean Six Sigma project is a key ingredient for success during the launch phase of your Lean Six Sigma initiative. Process improvements can be a challenging task but if you have the right people with the right Lean Six Sigma skills on board then it is possible to achieve sustainable change. When you wish to achieve the results that you want with Lean Six Sigma, you need to change the way that you work and this means that you need to change how you think about the work. To successfully implement a Lean Six Sigma project, you need to select your best performers – the top talent – that are capable of learning and implementing new methodologies and you need to train them adequately to create your dream team. 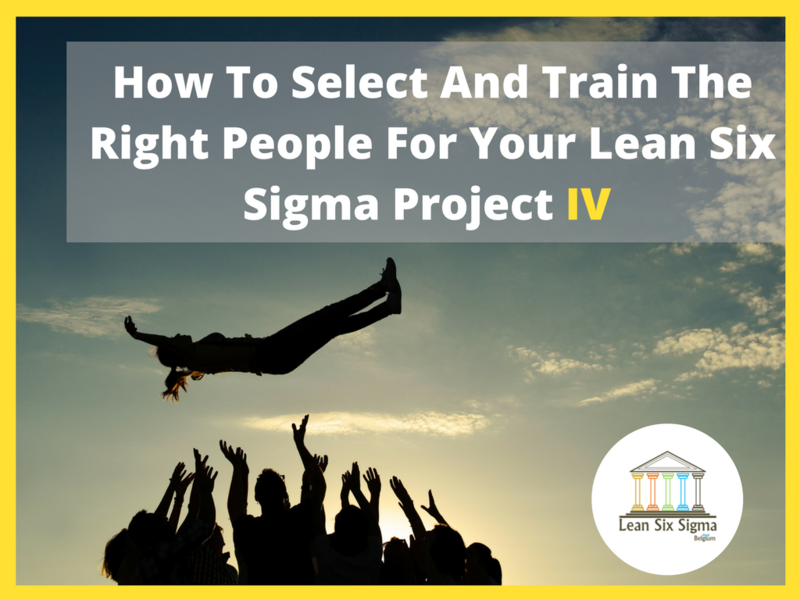 So, how can you select and train the right people for Lean Six Sigma? The Champion, also commonly referred to as the Lean Six Sigma Leader, is an executive leader of the organization that is responsible for driving the Lean Six Sigma initiative. The Champion reports directly to the CEO of an organization. A LSS Champion is accountable for the entire Lean Six Sigma deployment and supports the change by cultivating a Lean Six Sigma culture within the organization. This individual helps select projects, create a project charter, supervise projects on a weekly basis, and remove the barriers that might exist during project implementation. Every organization can have only a single LSS Champion who is generally a senior-level executive of the company and has received high-level training regarding the technical aspects of Lean Six Sigma and is also equipped with the skills of leading an initiative. A Master Black Belt (MBB), also known as the LSS Program Manager, is an experienced and successful Black Belt that has managed a number of Lean Six Sigma projects and is an expert in the methods and tools that are associated with Lean Six Sigma. A MBB reports to the LSS Champion of an organization. The primary role of a Master Black Belt is to develop the Lean Six Sigma training program for an organization and coach project management teams. A MBB is also responsible for assisting in the selection of projects, supporting the efforts of the LSS Champion, and monitoring the Lean Six Sigma projects. An organization can have a number of Master Black Belts for their Lean Six Sigma initiative but it must be ensured that a Master Black Belt is a full-time professional that is highly experienced and has successfully managed several projects as a Black Belt. Preferably, a company with 10,000 employees should have up to 8 Master Black Belts by the fifth year of their Lean Six Sigma deployment. A Black Belt (BB) is an individual that has advanced knowledge of Lean Six Sigma, particularly the methods and statistical tools, and possesses leadership qualities. The role of a Black Belt is to coach, manage, and lead the project team for a Lean Six Sigma project. Each Black Belt in an organization is responsible for leading one (or more) DMAIC projects in an organization and ensuring that the right data is collected and analyzed for the project(s). A Black Belt is also responsible for identifying and communicating the barriers in a project and providing regular updates about the project to a Master Black Belt. When choosing people for Black Belt training, ensure that you choose full-time professionals for your organization that have some team skills (which will be utilized in the training program). The selected individuals will then be required to attend classroom training for around four to five weeks where they will be taught about the methods, statistical tools, and technical concepts of Lean Six Sigma. Once a Black Belt has received their training, they should be required to manage a ‘test’ DMAIC project to assess their skills. As with Master Black Belts, a company with 10,000 employees should have up to 50 Black Belts by the fifth year of their Lean Six Sigma deployment. A Green Belt is a part-time professional for an organization that has some expertise about Lean Six Sigma (sufficient for leading a small LSS project). The exact role of a Green Belt depends on the requirements of an organization but generally, a Green Belt is responsible for assisting a Black Belt with one of their projects and for providing just-in-time training to others. However, if there is a need, a Green Belt might also be required to start and manage their own project under the direct supervision of a Master Black Belt. For selecting individuals for Green Belt, make sure that you choose a part-time professional for your organization that is willing to learn about the Lean Six Sigma process. The training program for Green Belts will require the chosen individuals to attend classroom training for a maximum of two weeks in which they will be taught about the methods and basic statistical tools of Lean Six Sigma. Ideally, a company of 10,000 people should have up to 200 Green Belts by the fifth year of their Lean Six Sigma deployment. Any professional in an organization that has general awareness or basic knowledge of Lean Six Sigma and can contribute to a particular project (through expertise and experience) is considered to be a LSS Team Member. It is important to mention here that a team member does not need to have any sort of formal Lean Six Sigma training. Though the role of such individuals is not well-defined in Lean Six Sigma, a team member can be anyone that provides expertise, provides data and resources, and helps identify opportunities for improvement for a project. The team members are generally more involved with an organization’s work and business processes and therefore, they can help in selecting the right DMAIC projects for the Lean Six Sigma initiative since they can see exactly where the improvements are needed in a business’ workflow. One common mistake that is made by most organizations is that they only choose technical specialists (such as statisticians, engineers, and quality professionals) as team members. For a successful and efficient implementation of Lean Six Sigma, it is important to incorporate the management (such as senior managers and process owners) as team members, as well. A Process Owner is a professional that is responsible for a particular process within a business and is accountable for achieving the desired performance for that process. Since each DMAIC project is aimed at solving a problem and improving the efficiency of a particular process, the process owner (for that specific process) must always be part of the Lean Six Sigma team. There is no need for formally training the Process Owner regarding Lean Six Sigma, though a short briefing will be beneficial for the sake of the project. The role of a Process Owner is defined by the Champion or Master Black Belt depending on the requirements of the project. However, the responsibilities of a Process Owner are to assist the Black Belt in the decision-making, data collection, and process improvement phase of a project. The Project Sponsor is a business executive that is responsible for providing the budget, resources, and strategic directions for the project team so that they can move further with the project implementation. This individual is also responsible for removing the barriers (particularly financial barriers) that could slow down the project’s process. Towards the end of a project, the Project Sponsor is responsible for celebrating the success, communicating it to all departments, and recognizing (and awarding) the key players of the project. Again, each DMAIC project will have only one Project Sponsor that will act as a facilitator and a supervising body for the project. We have already discussed how you need to go about convincing and informing the executives to sponsor a Lean Six Sigma project. Every Project Sponsor should be well informed about the Lean Six Sigma process and should be involved in the communication process for Lean Six Sigma. Now that you know exactly what roles each individual has in a Lean Six Sigma organization, let us take a look at everything that you need to know about forming a Lean Six Sigma team for a project. How Many People Should Be There? You should appoint no more than six people in a Lean Six Sigma team. Each team member should be familiar with the involved process and should contribute towards the implementation of the Lean Six Sigma solution. The reason that the team should not have more than six members is because a large team can be ineffective since the responsibilities are diluted and it is more difficult to reach a consensus. If you feel as though a project cannot be completed by six people then the project is too large and complex and should be split into two or more smaller projects. Who Should Be A Part Of The Team? There must always be a Black Belt (team leader) and a Process Owner associated with each project. Additionally, a Green Belt should be included in the team, if necessary. The remaining members should be Lean Six Sigma team members who are available at least 25% of the time for working on the team and should be familiar with the process that has to be improved. While a Project Sponsor is generally considered to be associated with a Lean Six Sigma project, they are not counted as a core team member since they are not directly responsible for implementing the solution or taking any action towards the process improvement. Who Should Form The Team? The best approach towards forming a team is for a Black Belt to consult with the Master Black Belt, Head Of Divisions (the managers to whom the potential team members report to), Project Sponsor, and the Champion (if possible). The Black Belt first directly consults with the Master Black Belt and/or Champion to discuss the potential team members. After this, the Black Belt gets approval from the team members’ respective Head Of Division to include them on the team. Once this is done, the barriers to the project are identified and reported to the Project Sponsor and/or Champion who resolve the issues before the project can be implemented. Any additional training that might be required by the team members can be directly delivered by the Black Belt or Green Belt before the work on the project begins. The problem that most organizations face when they are first getting started with Lean Six Sigma is the lack of resources – not in terms of budget, but in terms of available time and skills. For instance, when you train a Black Belt for leading a project, you essentially require them to stop whatever they were doing in the organization. Now, the first question that a manager will ask you is about Lean Six Sigma is how to backfill the space that was left behind? While some might suggest that hiring new employees (even for the Lean Six Sigma program itself such as MBBs or Black Belts) is a possible solution but this takes a heavy impact on your revenue (more recruitment = more expenses). Thus, the most popular solution to this problem is to reevaluate and reassess the existing roles of employees within the organization and reprioritize the resource utilization so that you can deploy Lean Six Sigma using the existing resources. For this, you need to identify the employees that are not working to their full potential i.e. underutilized employees. Assigning more responsibilities to these employees (such as the responsibilities that are freed up by a Black Belt) will help you create more resources without having to increase expenses. 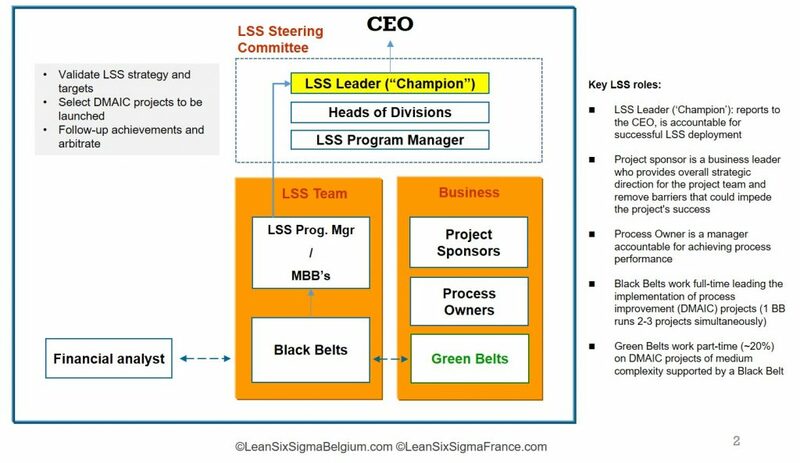 The key positions in a Lean Six Sigma organization are the Champion (Leader), Master Black Belt, Black Belt, Green Belt, Team Member, Process Owner, and Project Sponsor with each member having their set of responsibilities. A Lean Six Sigma team for each DMAIC project should consist of no more than six members, with two of them being a Black Belt and a Process Owner, and the remaining being Team Members that are familiar with the process being improved. The formation of a team should be done by the Black Belt in consultancy with the Master Black Belt, Champion, Project Sponsor, and Head Of Divisions. It is important that you recognize the need for resources within an organization – you cannot simply free up important business work to accommodate the Lean Six Sigma strategy nor can you spend generously on hiring new staff. For properly utilizing resources, u need to identify unrecognized capability and underutilized capability to enable resource sharing so that you can implement Lean Six Sigma without having to spend more resources.